It’s almost time. The turkey is defrosting, the wine has been purchased and we’ve unearthed the tablecloth. We are poised for that magical holiday: when our family gathers around the groaning table for the annual telling of the “Time We Left Brenda At The Parade (and blithely journeyed on to Thanksgiving dinner without her)” story. As the first words are uttered, eager faces turn upwards and the chattering ceases. We settle into a quaint familial posture, reveling in this heartwarming tradition. The story never alters. The ending always the same. The mother invokes her; “I knew she didn’t do it on purpose” line. (Dear reader, I implore you not to spend too much time wondering how a child leaves herself at the parade on purpose.) The father shamefaced, swears he has reformed his communicating ways. And then we eat. The variety of food is more or less the same regardless of who hosts. The turkey has the most variation from year to year. Butterball, free range, organic, kosher, we’ve had them all. Under-cooked and over-cooked, we’ve lived to celebrate another year. Sweet potatoes have been canned, candied, mashed and stewed. I’m here to tell you, it makes no difference whatsoever. Change recipes if you’re bored, knock yourself out if you love to cook. But whatever you do, don’t worry about it. No one cares. This is not the time to channel Billie Burke in Dinner At Eight. No one gives a hoot about the aspic. You are not preparing for a gourmet magazine photo shoot (which is a good thing considering what they do to the food to have it photograph well!) People are coming to your home because they want to be with you. They are delighted to not be cooking AND to be fed. They don’t care what state your home is in (as long as you have the necessities in the loo.) They are not measuring the viscosity of your gravy or the moisture level of your bird. There’s no such thing as a flaky crust in a pumpkin pie, and no one cares if you made all or none of it yourself. Being knackered is no way to enjoy a holiday. Buy what you can, prepare ahead of time and above all else, delegate. People like to feel needed. Thanksgiving is one of the few holidays we have that’s sole intent is gratitude. There are no cards, gifts, tips or parties. The only societal expectation is that we gather with family and/or friends, eat and drink in excess and give thanks for the opportunity to do so. This year, just like every year, after the last bit of pie has been scraped out of the dish, and the top buttons have been opened, one of us will chime; “remember that year we all had the flu and the ones who could keep food down had turkey t.v. 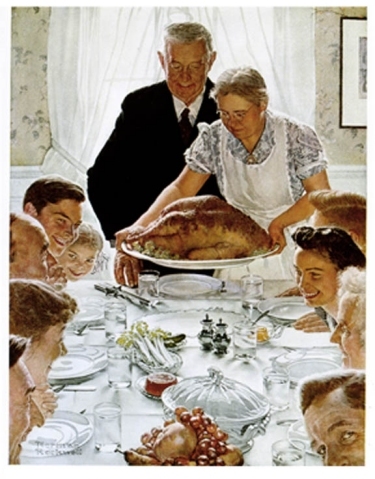 dinners?” That, dear reader is what great Thanksgiving memories are made of.